In the morning, Bill seemed to have developed ' a bit of a head'! Heaven only knows why? 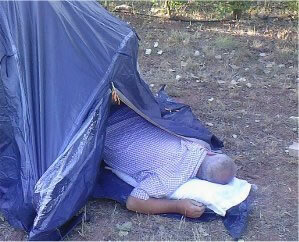 He emerged, just head and shoulders out of his tent, before collapsing again and muttering I'm never drinking with that Henry Price again. Another camera moment. We cooked up some breakfast. Bill didn't seem to feel much like a fried egg for some reason? Plenty of nice strong coffee, after which Bill looked a little bit more human. We checked the bikes, topping up as required, and waving our hosts farewell, headed north for the bridge. We motored on up the Autoroute Norde and I managed to do my running out of juice trick again. Henry came to my rescue with the contents of his unleaded primus stove and a little from his tank and I was back in business. Of the three bikes, mine was always going to be the problem. Henry had the larger capacity tank and Bill was achieving much better m.p.g. (for petrol at least) that I was. I don't think that Bill ever went onto reserve throughout the whole trip. Soon, around another bend and the bridge was beneath us! 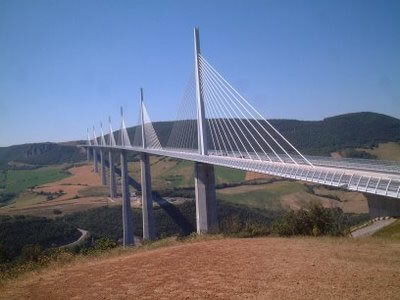 It is a magnificent structure and, considering its method of construction, i.e. that the deck of the bridge was shunted out from the northern end across to the southern end seems to be beyond belief! After photographs and yet more admirers of the trio of Enfields in the car park, we set off again for Brendan’s place. We had arranged to meet Brendan in a bar in the town (good plan), at 4.30. I managed to get a message to him that we were on the way but were running late. We arrived, at last, just before 5.30. Brenda greeted us with ice cold beers and we presented him with his official Lonely Bob's Magic Cloth to help him keep his shiny bullet in good order. After downing the beer, we followed Brendan for a mile or two to his delightful farmhouse which is really in the sticks. It has such a lot of character and there is plenty to keep Brendan busy for a little time to come. Saying that, we reckon that he has storage capacity for at least two dozen bikes! On the downside, Brendan explained that the winter usually brings over 1 metres of snow with it. Henry started to dream of an Enfield Snowmobile. Brendan and Henry disappeared into the barn and, after rummaging around, found an old Solex trailer. No prizes for guessing whose bike it got attached to for a photo opportunity? Brendan soon had the BBQ was ablaze and Monica had prepared a lovely spread and, not for the first time, we dined like Kings! We had to protect all of our food from the chickens who were not averse to jumping up and stealing from the plate on your lap! The dog did his bit as well; but more of him later. The view to the West was an horizon silhouetting the volcanic mountains that hold the source of the Volvic water company. Not a caveman in site apart from the unshaven Henry and me! We chatted and swapped anecdotes until the light disappeared and then looked to bed down. 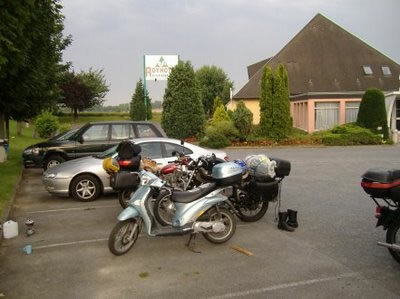 Tomorrow, the plan was to get past Paris and as near to Calais as we could before stopping again. We would need a good night's sleep to be ready for a long ride ahead. We set about retiring for the night and Bill and I took up Brendan's offer of a piece of lounge floor to park our bedrolls on. Henry, who was getting a taste for the outdoor life, pitched his tent in the yard. The frisky dog settled onto his bed in the hallway behind the front door and Brendan et famile retired upstairs. We were all soon asleep until Bill woke in the wee-wee hours with the call of nature. In the darkness, and without his glasses, Bill groped his way out of the front room and dressed only in his pants and vest, began to feel his way along the wall of the hallway towards the ground floor bathroom. The dog awoke at this point and instead of barking, decided to check out the stranger. In stealth mode, he crept up behind Bill, (shuffle shuffle) and decided to investigate the aroma. He planted his nose deep into the crevice of Bill's underpants from behind. Bill, who until now hadn't noticed the dog, was now suddenly fully awake and more than a little surprised, to say the least! As he shuffled, the dog shuffled with him until he disappeared into the sanctuary of the bathroom. Bill had tried hard to shuffle without exposing his 'main course' to the dog. Bill's journey back to the bedroom was almost as exciting although, not so much of a surprise. After a hearty breakfast, we mounted up and, with Brendan at the front, headed back to civilisation. We waved Brendan goodbye at the toll plaza for the motorway and headed for Paris and Le Périphérique! Why somewhere the size of Paris doesn't have an M25 I do not know! For those of you not familiar with Le Périphérique, it is a dual carriageway / motorway ring road around Paris. Being, what it is and where it is means that there are a great number of junctions, slip roads and flyovers squirting off in all directions, all on top of each other. Add to that the fact that we were going to have to negotiate it on a hot summer Sunday afternoon when the traffic was at its busiest and the fact this circus was full of French drivers who had spent all the morning at the battle de l'Arc de Triomphe topped off with the fact that we didn't have a clue where we were going and you have an idea of our problem. It is a nightmare. We had a good distance to go to keep on track with our required schedule if we were to make our booking at Calais so we really couldn't afford too much time being lost. I decided that the best chance of success was to let the Sat Nav do the work. We pulled over and had a break south of Paris. We had to enter the orbital at 6 o'clock and exit at just after 12 o'clock. I punched in a destination on the A1 out of Paris for Calais and explained to Bill and Henry that they needed to make sure that they kept close. It would be too easy to become separated in the war zone of traffic that we were about to encounter. Deep breath, a quick flash of the Eifel Tower over the flat Paris landscape and we were in. It was hell! Like riding through an industrial washing machine on heavy soiled wash. We discovered that many French motorists like to wave to British tourists. Mainly with the middle finger of the left hand. And, apparently, the French for Hello mate is merde! I'm learning all the time. When I opened my eyes, we had come out the other end, on the right road, in good time, and no one missing! All together, a bloody miracle! We continued north east towards Lille, looking out for either a camp site or a lodge. Mile after mile, nothing. We decided that time was marching on and we were knackered. We had covered more mile today than any other on the tour. We left the A1 at a little place called Roye. We found a cheapo lodge but it was full. The only other place in town was the Hotel Roye. It was not going to be cheap but took a vote on what to do. Bill wanted to go on and find somewhere cheaper. Henry and I were bushed and wanted to stay here. Bill agreed to go with the flow and we checked in to a triple bedded room. Henry and I showered and changed and wandered over to a local restaurant while Bill crashed out and watched some football on the TV. Tomorrow would prove Bill to have been right and Henry and me wrong but - C'est la vie! As a point of interest, Roye is very close to The Somme. Another day perhaps?